teamthing comes loaded with powerful fundraising tools to help enable you to raise some much needed funds for your club. The tools give you full control over your fundraising, from the comfort of your dashboard. Hassle-free interface. Creating your new fundraiser is as simple as adding a new news item to your site. Thank you message. Use the default confirmation email after donation or customize your own to easily send a thank you and tax receipt. Monitor your donations and fundraising goals, including a progress bar, from your dashboard, with the option to display public fundraising goals and progress on your site. Check out Fundraising in action . . .
Just follow our simple ‘getting started’ instructions to begin creating fundraisers. 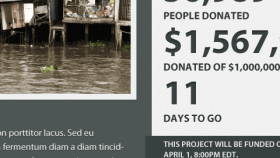 Adding an fundraiser to your site is as easy as writing a news article. You’ve now got a fully-featured fundraising system on your teamthing site. With a hassle free system for monitoring your donations and fundraising goals.